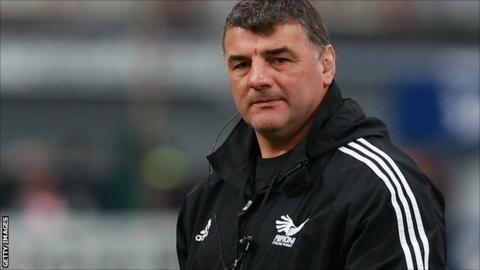 London Welsh have appointed Neath director of rugby Rowland Phillips as their new defence coach. Formerly defence coach for Wales, the 49-year-old was part of Gareth Jenkins' coaching team for the 2007 World Cup. He has also worked in that role at Ospreys, Ebbw Vale and Aironi Rugby in the Pro 12. "The Premiership is a huge challenge, but the challenge makes it even more exciting," said Phillips, who was capped 10 times by Wales as a player. "We've clearly identified that the defence needs to be improved and that's going to be my job. "After two seasons with Aironi in the Pro 12 it's great to be stepping back up into a full-time professional rugby environment. "I know Justin (Burnell, head coach) very well and I've got a lot of respect for him." Phillips, who made 290 appearances for Neath, spent two seasons with London Welsh as a player, making 66 appearances and scoring 18 tries. "As a player I had two great seasons at London Welsh and it's great to be coming back to the club," he said. "My first season we were in Division One and we got promoted alongside Worcester, so I've got a good strong connection to the club and I have very fond memories of my time there." London Welsh are yet to win a game in the any competition this season and lost 47-7 to Bath in the LV= Cup on Saturday.